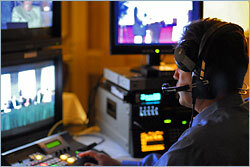 This service allows two or more locations to simultaneously interact via two-way video and audio transmissions. It’s a great way to reach remote participants, especially those unable to attend an event. Packages include telecommunications, equipment, and technical support.